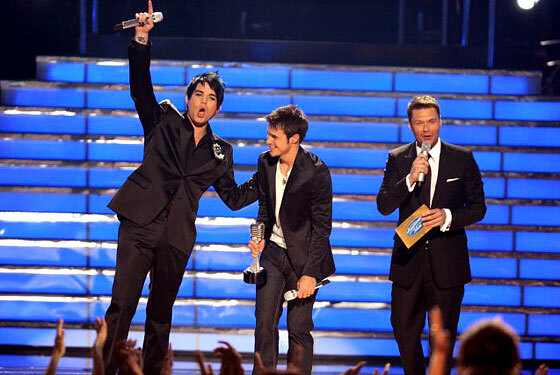 Let me be honest from the beginning: I voted for Kris Allen. Three times — in spite of a longtime personal policy against voting for American Idol, and a similar discriminatory attitude toward people who spell my birth name with a “K.” I just didn’t LIKE Adam Lambert. Not his screechy sameness, not his look, and not his endless vamping. But over the past few days, I’ve spoken to several gay friends (and read some screeds online) that suggested I should have voted for Adam out of loyalty to my kind. In a way, it doesn’t matter whether Lambert is gay or not. When placed in the context of Kris, or even Danny Gokey, he represents The Other. He comes across as obscenely gay, in the sense that eyeliner, high-pitched wails, and camp costumes say (nay, scream) queerness. He wore WINGS last night, for the love of Dorothy. The online pictures of him kissing men and his refusal to specify his sexuality are immaterial in the end. I think we can all agree that by the end of the season, Kris was the straight heartthrob, and Adam was, well, the alternative. The more talented, vocally gifted, riveting alternative. But for me, seeing him perform with Kiss was an important reminder: Adam, for all his talent, wasn’t breaking any camp boundaries that hadn’t been broken before. When he and Kris sang “We Are the Champions” with the surviving bandmembers of Queen, it wasn’t Adam’s (admittedly stronger) performance that felt transgressive. It was Kris’s. The squeaky clean, Über-Christian poster boy vamping it up to Freddie Mercury’s lyrics was more of a revelation than Adam’s slash-and-burn versions of Aerosmith or Led Zeppelin could ever be. Sure — Adam’s success feels like a revolution because America VOTES on American Idol. The winner is chosen by US. But for decades now, the success of artists has been decided democratically. Public referendum is what determines the Billboard charts and platinum-record lists and MTV Video Music Awards. Sure, it’s also largely based on marketing and record-company deals with radio D.J.’s. But the ability to capture the public imagination is what makes an artist catch fire — whether it’s Bruce Springsteen (straight), David Bowie (officially gay when he was at his peak), or N*Sync (something in between). We’re now in the era of Lady Gaga, a straight woman who performs as a transsexual man, for Pete’s sake. Of course I was hoping that Red State America would find it in their hearts to embrace Adam Lambert. That’s what the judges of American Idol were so desperately, baldly hoping to accomplish. But as a gay man who just wants his way of life to be normal, I can’t help but be satisfied with Lambert’s second-place finish. He’ll have an amazing career for the rest of his life, where again public affection will determine his success. But for me, having him not win was telling. Not every gay needs to be universally likable. And in a competition where the obvious talents of an Allison Iraheta fell to the boyish charm of a Danny Gokey, it’s important to recognize that straight women rule the results. There’s nothing wrong with that — they’re the demo. Gays just want to get in the game. Adam Lambert, whatever he is, got us in the game on American Idol for the first time ever. Everyone will remember him as the more talented performer who lost to the more appealing one. And that’s enough for me. I live in America, after all.